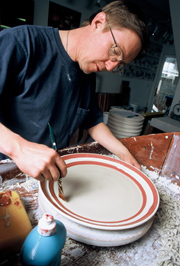 In the business and participation of the artist in porcelain pottery making, inspiration enters from many angles. Most often it appears as part of the endless circular process from preparation of clay to greeting customers on opening night. The pots are formed and slowly dried to a leather hard state, then trimmed, decorated, dryed, signed, bisque fired, waxed, glazed, glaze fired, sanded, priced, a show created, a deadline met, and once again a new beginning to the process. Most often inspiration comes from working, but an artist learns to make room for light that enters fron any angle. A friend and collector from D.C. recently returned from a trip to Japan, including an exhibition of pottery from which she sent me a color postcard. I have explored vibrant glaze color on porcelain for a quarter century, but this image stopped me in my tracks and transported me to another world. The postcard was a picture of a classically formed bottle with a glaze described by the potter as “pink celadon,” which my friend described as “supremely beautiful.” To have some knowledge, gained experience, and recources to be able to pursue such a moment, no matter how dire the ever-present and latest deadline might be, is the great pleasure of my life. I had never considered such a glaze color possible, a pale and translucent pink glaze with hints of lilac, very thickly applied and beautifully crackled. At such times I have always gained the most help from the second edition of a book by Robin Hopper, “The Ceramic Spectrum, A Simplified Approach to Glaze and Color Development.” From extensive exploration of this book, I often wonder about “simplified,” but I love his intent and I understand his use of the word. I anticipate a year’s work to duplicate this astoundingly beautiful glaze, and once again, the great circle expands.